The Paulista Avenue in Sao Paulo is a very nice commercial street. There were many decorated buildings, like the Real Bank. 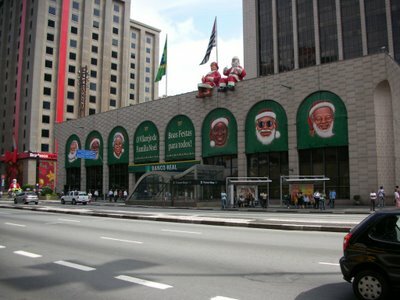 It's funny that in the southern hemisphere Christmas happens during summer so, in a tropical country like Brazil, Santa Claus and Mrs. Claus must be sweating a lot! super et amusant, toutes ces versions de pere noel. tres bon. super and amusing, all these versions of Father Christmas. very good. Hey, what are you doing over there old fellows?